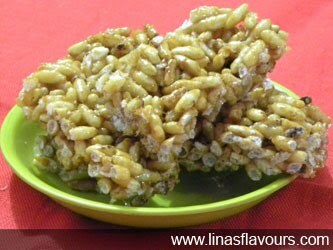 Take a pan and roast mamra/puffed rice on a low flame, till it is crunchy. You can even do it in an oven for 3 minutes. Grease the flat surface- thali or stone surface with ghee, before you start making chikki. Take a pan and heat jaggery on the low flame. Stir it till it turns into liquid. Add ghee and stir it till turns into light brown. Add mamra and mix it well. Switch off the gas stove. Pour it on the greased surface. Press it slightly with a spatula and roll it out by using a greased rolling pin. Let it cool. Cut into square pieces and store it into airtight container.